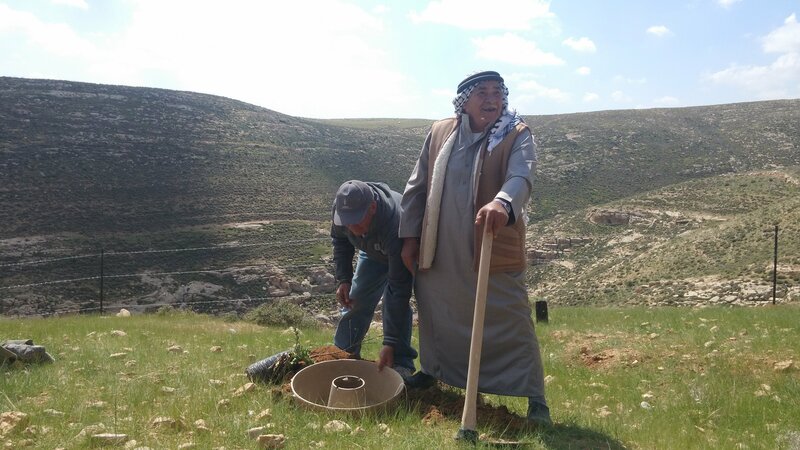 Photo 1: A Palestinian farmer planting a tree using Cocoon technology, Hebron , Palestine. LLC was founded in 2014. In 2015, it won the Postcode Lottery Green Challenge, one of the world’s largest competitions for sustainable entrepreneurship, and has since collaborated on large-scale land restoration projects, including restoring the monarch butterfly habitat in Mexico with the World Wildlife Fund (WWF). LLC is also the inventor of the COCOON technology, which is a sustainable, scalable and low-cost solution for growing trees in dry and degraded soils without irrigation. The UAWC is a Palestinian non-profit organization, established in 1986 by a group of volunteers and agronomists in response to the vulnerable socio-political situation of farmers that resulted from Israeli confiscation of land and water in occupied areas. Agricultural committees were formed in the West Bank and Gaza Strip to set the farmers’ priorities and help the UAWC implement its programmes and community activities. The UAWC’s vision is to achieve a free, democratic Palestinian society that is food secure and enjoys social justice and sovereignty over its resources; where farmers, both male and female, contribute effectively in all aspects of life. Photo 2: Life land Company team during the Opening Ceremony. The COCOON is a low-cost, biodegradable incubator for young tree seedlings, enabling trees to be planted sustainably and affordably in arid and degraded soils. A water reservoir, which is filled once at the planting stage, is designed to prevent evaporation and weed growth around the base of the tree. Water is transported from the reservoir to the tree using wicks. As the reservoir degrades and becomes organic substrate for the soil, it leaves behind a micro-catchment that collects surface run-off when it rains. A shelter connected to the base of the COCOON protects the seedling from harsh weather conditions and small animals, particularly during its first year. Finally, natural fungi are added to the soil around the roots. These promote a healthy root system, so that in time the tree can extract enough water from the sub-surface supply to live independently. The technology requires no follow-up irrigation and increases the survival rates of young seedlings by an average of 75-95 per cent. It also helps to restore the top soil and consequently improve rainfall infiltration. 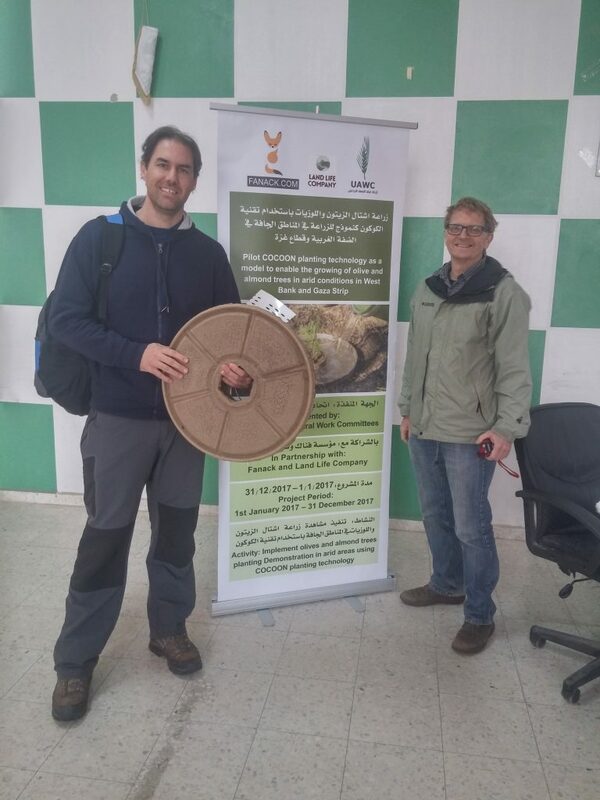 The main aims of the COCOON pilot project are to introduce knowledge and innovative ideas to Palestine and, consequently, to contribute to a healthier environment and increased agricultural production in areas with degraded land and scarce water sources. This will be achieved by planting 200 trees in West Bank and 300 trees in Gaza using the Cocoon planting technology. • Educate Palestinians on the benefits of trees, healthy ecology and water efficiency. Palestine suffers from severe water shortages due to the Israeli occupation and restrictions on natural water resources, as well as high aridity and limited rainfall in several parts of the country. Agriculture is the largest consumer of water, accounting for more than 62 per cent of total use. The amount of water currently used for irrigation is about 141 million cubic metres per year (MCM/yr) to irrigate around 200,000 dunam (1 dunam is about 0.1 hectare), of which 55MCM/yr is used in the West Bank and 86MCM/yr in the Gaza Strip. In this context, the agricultural use of the COCOON technology in Palestine is very applicable. In addition, the one-off irrigation of seedlings makes the technology valuable to Palestinian farmers who do not have regular access to their land due to Israeli restrictions (for example, land located behind the separation wall). PWA, 2014c. Final Water Sector Policy and Strategy, 2014. Available in Arabic at: http://www.wafainfo.ps/pdf/Water_Strategy_2014.PDF.